With a course that runs more than 3.500 years, the name Nemea is a synonym for wine quality and culture – and justifiably so. Winemaking probably began at an early stage of its history, since this area is mentioned by Homer as “Ampeloessa”, meaning full of wines. Winemaking is also considered a characteristic of the ancient city of Fliunta, site of production of Liastos Wine, the “royal wine” that Agamemnon supposedly drank in the royal palace of Mycenae. Fliuntas (whose old name was Phlius or Phleious) was an ancient city-state of Peloponnese, built on the plain of Phlius, 2 km northwest from today’s Nemea and situated at the banks of the river Asopus. It was an Ionian city, and following the Dorian invasion, many of its residents fled for S amos and Asia Minor. Today (from excavations done from 1924 to 1970), ruins of its city wall, its theater and its assembly house, have been uncovered and preserved as monuments. Other things found from the excavations are golden coins dated to the 5th century B.C., bearing the inscription “Phliasion” or merely the letter “Φ” (“F”), often surrounded by vines, which were the sacred plant of Dionysus. Several golden coins feature depictions of grapes, which constitute undeniable evidence that the wealth of Fliuntas was a result of vines. The wider region of Nemea is the largest wine-producing zone in Greece and the Balkans in general, the place where the famous Nemea wines of Protected Designation of Origin and Superior Quality are produced. 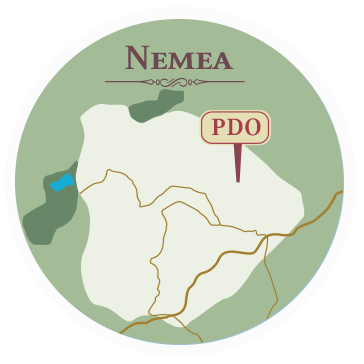 Nemea is the largest Protected Designation of Origin (P.D.O.) zone in Greece, stretching over almost 30 Km2 of grapevines, beginning at an altitude of 200 meters and reaching up to 850 meters. These large differences in altitude differentiate the course of maturation of grapes, as well as their Potential Alcoholic Strength (P.A.S.). The grape production of the fine, vibrant variety Agiorgitiko is used exclusively as a raw material for Nemea wines. It considered as the noblest red variety of Southern Greece and gives medium-sized grapes, with a cylindroconical bunch, densely clustered, with spherical, medium sized grapes, soft flesh, and thick blue-black skin. Agiorgitiko variety, also known as Nemea Black or Mavroudi of Nemea, is one of the most fine and rich in color Greek red grape varieties. Agiorgitiko can give a wide range of wines with deep red color and a complex aroma palette. The main aromas of this variety are red and black fruits, but also a wood aroma that is pleasantly preserved after ageing. Low acidity combined with the balanced tannins of Agiorgitiko produce both red and rosé wines with freshness and a gentle character, and aged wines with complexity and ripe body.